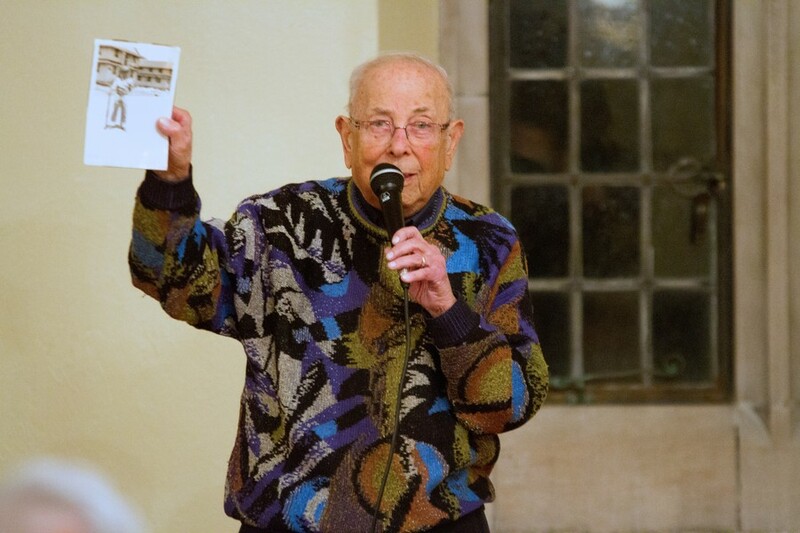 Holocaust survivor and longtime Hyde Park resident Herman Cohn was 17 years old on the night of Kristallnacht, or the “Night of Broken Glass.” Exactly 75 years later, Cohn recounted the events of November 9 and 10, 1938 and shared his extraordinary life story at Ida Noyes Hall Tuesday night. Kristallnacht was a state-sponsored pogrom against German and Austrian Jews in which Nazi thugs wrecked thousands of Jewish-owned stores, burned down over a thousand synagogues, and sent 30,000 Jews to concentration camps. The death toll that night was nearly a hundred. Cohn, 92, still vividly remembers the horrible events that unfolded in Cologne, Germany. While walking by a Jewish-owned clothing store, he saw a truck pull up. “About a dozen men jumped off the truck with iron bars in their hands,” he said. They then proceeded to smash the windows and destroy the store’s clothing stock. As he kept walking, he saw more and more signs of the pogrom. “I noticed that they had piled [Jewish] prayer books out on the sidewalk…and saw they were lighting a fire,” Cohn said. The Schutzstaffel (SS) didn’t just burn prayer books. They set fire to the city’s synagogue, while “the fire department protected [adjacent] buildings,” Cohn recalled. To this day, Cohn does not know with certainty why the Gestapo released him, but he speculates that it was because his father had befriended a Gentile man who eventually became a high-ranking official in the SS and who had helped return stolen items to his family after members of the SS police force ransacked their apartment. Because he was still 17 years old at the time, Cohn’s father managed to get him on a train out of the country. Cohn spent a year in a youth hostel in the Netherlands before his parents acquired a visa to enter the U.S. in December 1939. His family reunited in Rotterdam and then moved to Chicago, where he has lived ever since. Landing on Omaha Beach two years later, his unit crossed through France and eventually reached his native Germany. Then, in an extraordinary twist of fate, Cohn helped liberate the concentration camp at Dachau, the very camp in which he would have found himself incarcerated had he not boarded a train to Holland six years earlier. His grandmother had perished in a similar camp at the age of 84. Cohn returned to a fruitful life in Chicago after the war, creating first a dry-cleaning and tailoring shop and later a men’s clothing store located at East 55th Street and South Lake Park Avenue. He and his wife have three children.